HE SAILED THE SEVEN SANDS in a chromium-plated, Buick Sand Yacht, looking for the old Silky Road. Adjusting the black patch over his right eye, Gurvalik Urdmet switched off his tablet, tucked it in a pocket of his Buccaneering coat and cast his gaze over the line of hills along the horizon, searching. He recognized the particular little dip to one side of the hills locating the place where he’d left his cache. Restarting the motor of his Buick Sand Yacht, he sailed over to a little valley between the hills intersected by the Selenge River, noticing what looked like a milestone half buried in a drift of sand. “That’s funny, I’m sure that wasn’t here before,” he murmured. Dismounting from the saddle of his Buick Sand Yacht, Gurvalik stepped over to the milestone brushing off a layer of sand caked over its surface. Two blocks of symbols were revealed; one in Chinese Pinyin or Hànzì [Hanyu], the other in English; Ulaan Bator 171 miles SE – Orkhon River 43 miles E.
He got his tablet out and thumbed a query: mileage from Ulaan Bator to Lhasa. The answer flashed up, 1511 miles. Virtually nine hours at his top speed of 175 mph on the flat, he estimated. Pacing round to the rear of his vehicle, Gurvalik stretched his arms and yawned in a most pandiculating manner. “Time to clamber out of this buccaneering clobber and reassume my other identity as Billy Sollocks, harebrained and sporadically employed punk rock singer and looney libertine,” he said, reaching in a pocket of his seventeenth century styled buccaneering jacket and withdrawing the haul of his latest venture. “Not bad considering nothing aside from some tenuously pre-booked engagements near Lhasa is coming my way on the punk rock gig scene lately,” he reflected. Buccaneering could be more than a sideline. It was sometimes a very lucrative occupation. Gurvalik recalled the time when he ambushed the Trans-Siberian Railway near Ulan Ude sixty-two miles southeast of Lake Baikal and three hundred and sixty-three north of Ulaan Bator. Not far from where he was standing now; just a couple of valleys to the East in fact. There was the Yaroslavsky express zooming down from Siberia towards Mongolia on its six-day plus journey from Moscow to Vladivostock, only to be confronted with what was probably the most unusual sight they’d ever seen. Didn’t they get a shock when they saw Gurvalik’s Sand Yacht swooping in from the desert like some huge ghostly spacecraft and hurtling down from the sky to end up skimming some twelve feet above the railway track towards them with a sonic boom and an inertial wavefront, stopping the train in its tracks. They got an even bigger shock when Gurvalik stepped out in full seventeenth century style buccaneer outfit: huge bushy black beard with matching black eyepatch and wide-brimmed tricorn hat over a luxurious wig of ebony curls, standing six-feet seven in his high-heeled, thigh-length, cuffed leather boots; holding a pair of enormous Magnum 44s fashioned craftily as Jacobean flintlocks. There was a silent pause and then with a startlingly fast movement he fired, first one pistol, then the other into the driver’s cabin. The plate glass shattered and the wall behind fractured as if hit by a pile-driver. There were screams and shouts as the driver and passengers evacuated the train with remarkable rapidity and assembled in a ragged line on the railway siding, trembling and chattering together. “Silence,” roared Gurvalik. “Right, now listen carefully. I’m placing this sack on the ground in front of me. One by one, I want each one of you to place all your valuables into it. That was one of my early ventures and profitable enough to persuade me that the buccaneering occupation was a viable proposition, Gurvalik recalled. He based himself in Baluchistan in those earlier days and became known as the Buccaneer from Baluchistan. People sometimes assumed he was ethnically Persian, although genetically he was seventy-five percent Asiatic Turk. The remaining European percentage had a distinctive British quality which brought out both the suave cultured gentleman and the uncouth back-street rebel within him. And now it is time for me to become Billy Sollocks again, he decided. Gurvalik the buccaneer alias Billy Sollocks the punk rock singer surveyed his surroundings from every conceivable angle, his eyes swivelling left, right and centre. Up, down and sideways on. He even bent forward and tried to look behind him through his legs akimbo. “Ooh!” He straightened up, feeling a bit dizzy and shook his head to clear it. But it was already empty according to those who had employed him way back when as an odd job man, which since he soon discovered he was entirely unsuited for, is how he became self-employed, moonlighting as a buccaneer whilst tempting fate as a gigging punk rock singer of outrageous extrovert inclination. A man sometimes needs more than one source of income to survive. Gurvalik cast his gaze around once more. When he was satisfied that the coast was clear he took his eye-patch off, removed his beard and wig revealing designer-stubble and a shorter thatch of rainbow-coloured spiky hair, and folded his pirate’s jacket around his hat and stowed them all neatly away in the boot of his Buick Sand Yacht. Then, realising he still had his high-heeled leather boots on, he removed them and immediately sank down six inches to a mere six-feet one. The black patch could be exchanged for a black vizor or sunglasses, but which to choose? Gurvalik donned his glossy black visor then changed his mind and opted for the sunglasses instead. Next, he unzipped a deep purple mohair suit, a pair of maroon socks and off-white brogue stage shoes, a sinister collection of ear-rings and a gold nose-ring from his voluminous suitcase-wardrobe and stepped out of his Buick as Billy Sollocks, Punk Rock singer and activist extraordinaire. Swifly transferring to a jet-propelled Cadillac parked in a cavernous sunken bunker covered over with a tarpaulin reinforced with kevlar and titanium and secluded beneath a bank of sand, he jumped into its plush interior and ferried it clear, then stowed the Sand Yacht away in the bunker and relocked it. 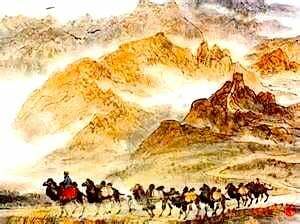 In the jet-propelled Cadillac Skimmer, Billy streaked across the wastes of Outer Mongolia, heading for Tibet, seeking the fabled city of Shangli-La where he had several gigs lined up. But where was the bugger? He still had to find it! Somewhere within the vicinity of Lhasa was all he had to go on so far. And first he had locate the Silky Road. He drove on, keeping an eye out for any signposts or a glimpse of a satin smooth road surface at every turn-off. Ah! At last he connected with the Silky Road and swung joyfully on to its super smooth non-slip surface. Merrily singing, “Sheik waggle an’ wail – Ya don’t do nothin’ but wag your doggone tail”, and “Jhimmi cracked corn and who fagging cares, he’s a vangar anyway,” Gurvalik Urdmet alias Billy Sollocks, stepped up his speed along the smoothly weaved silicate surface of the Silky Highway: Forty miles of bad road that had been magically transformed by Eastern Enterprises into a magnificent highway decades back who knows when. As Billy Gurvalik drew up to an observation post, a Janissary on a hover-cycle called out to him. Rummaging around amongst the odds and ends in his glovebox, Gurvalik pulled out a plain grey-blue turban placing it over his spiky locks. “From whence doth ye hail o strange stranger,” boomed the Janissary through a microphone attached to some kind of tank-like apparatus girdling his shoulders and chest. He swerved out in front of Billy Gurvalik’s vehicle with a hand raised authoritatively. “Baluchistan,” yelled Gurvalik Sollocks with a hysterical giggle at the Tungusic man’s appearance, reminding him of a prancing horse with his bushy plume-like column of hair extending upwards for at least six inches from the top of an otherwise shaved head and then curving down behind like some crazy exaggerated ponytail. My, how these Janissaries have changed, he mused. They used to be Balkans and Ottoman Turks and wore tall hats, long military dress tunics and boots. Now there’s even a bald-headed Hare-Krishna-style Siberian branch, What next, Irish and Eskimo versions? “How dare you sir, as if I would stoop so low as to possess a commoner’s document when I have here the Kinkh’s Pahdon,” Billy Urdmet replied disdainfully, producing a scroll which he handed to the Janissary, who unrolled it, scrutinized the turbaned photo of Gurvalik Urdmet stamped with the royal seal and read out aloud from the elegant script written within. Looking pleased and beaming all over his broad, acutely angled, slant-eyed Tungusic face, the Janissary bowed low and opened the gate, waving Gurvalik Sollocks onwards. “Sağ olun,” said Billy Gurvalik, opening up his window. With a cheery smile and a courteous wave, Gurvalik Urdmet come Billy Sollocks streaked off down the Silky Highway, boisterously singing all the bawdiest songs he could muster from memory and imagination, and making up some choice variations he would never remember again and wished could have been recorded while rendered. [to strangers, elderly people, or people you don’t know well]. 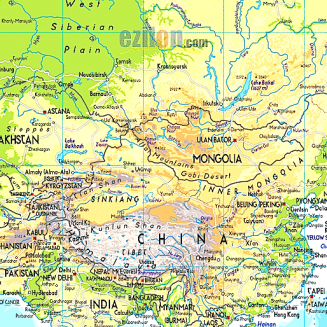 Map of Central Asia showing the location of the Altai Mountains, situated about 1,000 miles [1,600 km] eastwards from Kazakhstan into western Mongolia and northern China – and the Gobi Desert, a barren plateau of southern Mongolia and northern China. The official language of Iran is Persian [Farsi]. Persian is a West Iranian language of the Indo-European family of languages and is spoken in those parts of Iran where the Fars people, Persians, dwell, as well as in the Republic of Tajikistan. Tehran, Isfahan, Fars, Khorasan, Kerman and Yazd are some of the provinces inhabited by the Persians. 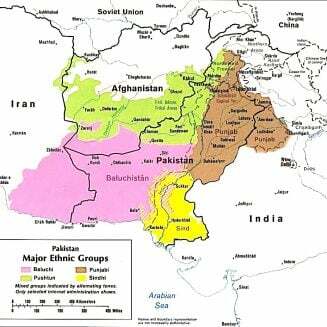 The Baluch or Baloch [Baluchi: بلوچ] are a people who live mainly in the Baluchistan region of the southeastern-most edge of the Iranian plateau in Pakistan, Iran, and Afghanistan, as well as in the Arabian Peninsula. There are two streams of opinion concerning the origin of Iranian Turks. The first maintains that they are the descendants of the Turks who either migrated to Iran in the 7th and 11th centuries or invaded parts of Iran at various times. The second holds that they are original inhabitants of Iran on whom the invaders have imposed their languages throughout centuries of occupation. The Iranian Turks live mainly in the northwest of Iran in the Eastern and Western Azarbaijan and Ardebil provinces, the Zanjan province, in Tehran, and are scattered throughout many other parts of Iran. Some of the central and southern ethnic groups, the Qashqaie for example, are Turkish speaking . The Turkish which is spoken in Iran is associated with the Turkish spoken in the Caucasus, but it has undergone varying developments in various regions. The Turkish dialect spoken in both the Azarbaijan province in Iran and in the Republic of Azarbaijan is Oghoz, which is the mother tongue of the Iranian Turks. The Oghoz have two accent groups: the northern and southern. The northern accent is spoken in the Azarbaijan Republic. The southern accent is prevalent in Iran, where the people have been influenced by Farsi. The differences in dialect, and in the culture and customs in particular, among the Turks in Iran has been largely ignored; the emphasis is generally placed on the Turkish language as a whole rather than other characteristics of the Turks in Iran. Several Turkish dynasties have ruled Iran in the past, including the Ghaznavid, Seljuk, Safavids, Qajars. The Turks are thought to be the largest non-Farsi speaking ethnic group in Iran. The Turkic peoples in general [of which the Turkish referred to above are only a Western sub-division] are distributed widely over Asia; particularly in the Siberian and Mongolian regions. The Turkic Language Group is classified as belonging to ALTAIC: a proposed Language Family of Central Eurasia, including Turkic, Mongolic, Tungusic, Koreanic and the Japonic languages. 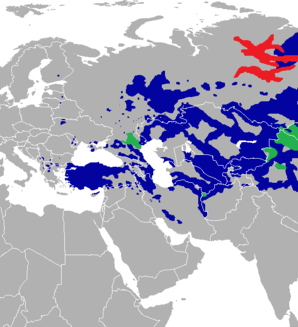 These languages are spoken in a wide arc stretching from Northeast Asia through Central Asia to Anatolia and Eastern Europe. 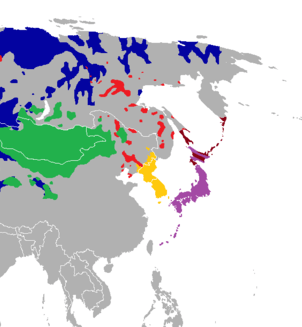 The Language Family is named after the Altai Mountains, a mountain range in Central Asia.